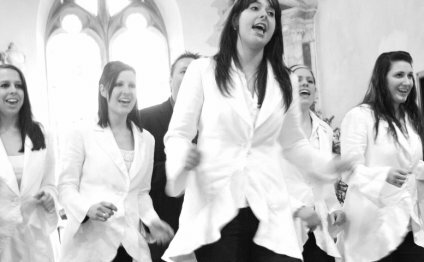 Vocal Works Gospel Choir have performed at well over 500 church and civil wedding ceremonies and drinks receptions – adding an uplifting and vibrant sound to weddings throughout the country and abroad. Our uplifting song list includes the best gospel, soul and pop classics – making us suitable for both civil ceremonies and church weddings. Whether you require 3, 4 or 6 singers accompanied by our pianist, a solo gospel singer or even a group and the VWGC band, Vocal Works Gospel Choir will definitely make a wonderful soulful and visual impact on your day that you’ll never forget…and your guests will be talking about for years to come! VWGC can greet your guests with songs as they enter the ceremony, perform for the bridal entrance, signing of the register and exit of the bride and groom – and boost the volume in the hymns. We can even learn a song especially for your wedding. VWGC can perform a mixture of uplifting soulful classics and love songs during the drinks reception or whilst your photos are being taken. Treat yourselves and your guests to a musical feast with VWGC performing at both your ceremony and drinks reception. Our previous wedding clients include the weddings of Natasha Kaplinski (Channel 5, BBC, Strictly Come Dancing) at Babington House in Frome, Matt Banahan (Bath/England Rugby) at Tracy Park near Bath, and Alex Lovell (BBC) at St Audries Park. to see what previous clients have said about the unforgettable contributions that Vocal Works Gospel Choir have made to their special day. Vocal Works Gospel Choir’s extensive wedding repertoire list includes a mix of uplifting soulful classics and love songs such as Oh Happy Day, All You Need Is Love, Something Inside (So Strong), Your Love Keeps Lifting Me Higher, Amazing Grace, Happy, Just The Way You Are, Ave Maria, Ain’t No Mountain High Enough, Signed Sealed Delivered, Make You Feel My Love, A Thousand Years, Rather Be, Thinking Out Loud plus many more for you to choose from. If there is something special that you would like the group to perform at your event we would be happy to learn it. VWGC have recorded and performed with artists including Peter Gabriel, Susan Boyle, The Heavy, Kerry Ellis, Bill Wyman, Brian May and Hayley Westenra, and released five albums albums – including ‘A Soulful Christmas’, ‘Gospel Rocks’ and ‘Seven’ which are available on or through our merchandise page.